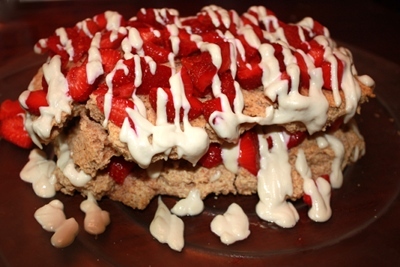 My favorite veganized version of the classic strawberry shortcake recipe. It's light and sweet and just slightly decadent with the delicious cashew cream sauce. As a little girl, I loved strawberry shortcake. In my pre-vegan cooking days as an adult, I used the boxed pancake mix and added milk and eggs to replicate the nostalgia of childhood. With this recipe, you get that same crispy but light, sweet but slightly savory flavor in the shortcake. Every spring when we get that first batch of fresh, local, organic strawberries, I whip up a batch of shortcakes and assemble this light and delicious dessert. It's a huge crowd pleaser, I think it's because the bright red berries topped with sweet white cashew cream is just so beautiful. Remember to choose organic for this strawberry shortcake recipe because strawberries top the list of the most contaminated fruits every year. It's harder for farmers to grow strawberries organically, but it is so worth it. Couple some organic fruit with the known health benefits of strawberries and you can almost call this a healthy dessert. At least it's healthier than the non-vegan version! Strawberries are the iconic fruit for shortcake desserts, but once that magical strawberry month passes, you could use any ripe fruit in this-- it's awesome with blueberries, raspberries, or peaches. Preheat oven to 400º F. Combine flour, baking powder, sugar, and salt in a large bowl. Add in margarine pieces and pulse (or use hands to pinch it) until the margarine is combined. The mixture should look like small pebbles. Add the nondairy milk and stir just until combined. Knead the dough gently on a lightly floured surface until it is soft. Split the dough into two equal circular pieces and roll or pat the dough until it reaches about ¾-1 inch in thickness. Place on a cookie sheet and bake for 15-20 minutes, or until lightly golden brown. 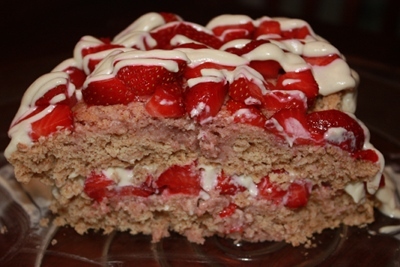 Once the dough is in the oven, cut the strawberries into thin pieces and mix in the sugar. The strawberries will develop a sweet juice as the dough is baking. Prepare the whipped cashew cream by blending all the ingredients in a food processor or blender. Adjust the flavors according to your tastes, and store in the fridge until you are ready to assemble the shortcake. The recipe should make about 2 cups of cashew cream. Allow the dough to cool completely before assembling. To assemble, layer the shortcake with biscuits, strawberries, and whipped cream, saving a few strawberries for decorating the top.